The Israelite people travelled from Raamses (Tanis) to Succoth (Ex. 12: 37), then to Etham (Ex. 13: 20), and then to Baal-zephon (Ex. 14: 2, 9) in order to flee from Pharaoh. The miracle of the waters parting didn't happen here (Gulf of Suez) in order for the people to go through the Red Sea (as is often depicted on Bible maps), but rather somewhere else. After Pharaoh's pursuit after the Israelites while on the 'Highway of the Wilderness' (still visible from the air today) [The other main route available in those days was the 'Highway of the Philistines' right along the coast of the Great or Mediterranean Sea, but not chosen by God], the people presumably turned off at Hazeroth (?) where they miraculously crossed the Red Sea through the Gulf of Aqaba. This possibility is confirmed by Gray's expeditions where they dived at the site of a sand bridge (roughly 300 feet deep) [A gigantic steep canyon of immense depth occurs underwater just off this 'bridge' to the sides], presumably separated at the time of the Deluge but miraculously joined when the Israelites crossed. The fact that the waters congealed (turning from liquid to ice due to a cold wind – Ex. 15: 8) [Meteorologically occurring today in specific areas in the Middle East, where rural people still use this phenomenon for refrigeration, and in Arizona, USA] enabled the people to cross on dry land (sand). God made a promise to Moses in the burning bush (Mt Horeb) that He would honour His pledge to the Israelites and that they will worship Him from this very mountain (Mt Sinai) (see Ex. 3: 12). However, Sinai's position and identification is traditionally accepted to be that of a mountain in Egypt so commissioned by Constantine the Great (reigned 306–337 AD). According to Scripture this cannot be correct, as Mt Sinai must be in Arabia (Gal. 4: 25). Mt Horeb or Sinai is in fact the Arabian 'Mountain of the Lord'! Surprising Discoveries, Vol. 2 (video). Advent Truth, Dunfermline. *DISCLAIMER: On closer scrutiny it appears that the information provided does not agree well with the biblical text. 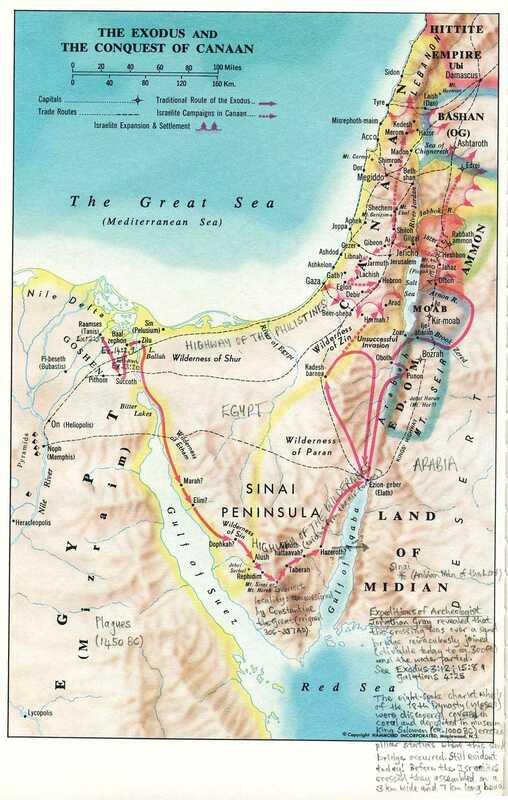 For instance, if the Red Sea had been crossed at the Gulf of Aqaba (alternative view), then why would Moses have led the Israelites all the way back to the Wilderness of Shur being directly east of Goshen (Ex. 15: 22)? The crossing at the Gulf of Suez (conventional view) is more compatible with the biblical text than Ron Wyatt’s evidence would like to suggest. The same errors seem to have been rehashed by Jonathan Gray and more recently by Bob Cornuke, at least insofar as the crossing is concerned.